Modernist Masterpiece in Columbia County. Inspired by two of the 20th century's most iconic residences — Mies van der Rohe's Farnsworth House near Plano, IL, and Philip Johnson's Glass House in New Canaan, CT — the Gefter-Press House is a one-of-a-kind architectural statement. 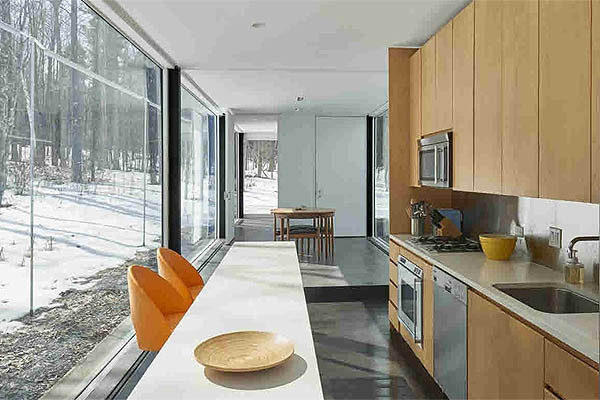 Located on a 12.7-acre wooded and secluded site among the rolling hills of Columbia County, NY, this home was designed by Columbia University professor and noted architect Michael Bell as an essay in transparency. Approached from the main road along a quarter-mile-long, unassuming gravel-and-dirt road, the magic of this single-story, all-glass-and-steel home is the way it dissolves into the surrounding woodlands. And while it's a haven of tranquility and privacy, it's only 2 hours from New York City, 20 minutes from Hudson, and 30 minutes from Albany. Top-line appliances are included. The house is published in "Masterworks of the 20th and 21st Centuries," by Kenneth Frampton, the eminent architectural historian (Rizzoli), in the company of The Farnsworth House (Mies van der Rohe); the Glass House (Philip Johnson); the Kaufmann House (Richard Neutra); and the Falling Water (Frank Lloyd Wright). For the architectural aficionado, this home is a rare opportunity to own a piece of modernist history. bedrooms: 3 baths: 2 area: 2,368 sq. ft.